Masorite; father of Aaron; generally called Ben Asher; lived at Tiberias in the second half of the ninth century. His father, Asher, was a great-grandson of Asher the Great (or the Elder), one of the earliest Masorites of Tiberias known by name (comp. the genealogy in Baer and Strack, "Diḳduḳe ha-Te`amim," p. 79). Pinsker ("Liḳḳuṭe Ḳadmoniyyot," i. 32) and Grätz (in "Monatsschrift," 1871, pp. 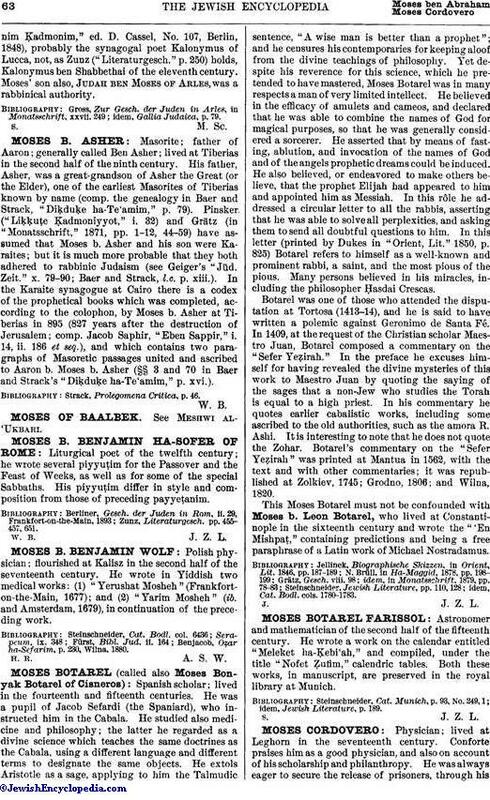 1-12, 44-59) have assumed that Moses b. Asher and his son were Karaites; but it is much more probable that they both adhered to rabbinic Judaism (see Geiger's "Jüd. Zeit." x. 79-90; Baer and Strack, l.c. p. xiii.). In the Karaite synagogue at Cairo there is a codex of the prophetical books which was completed, according to the colophon, by Moses b. Asher at Tiberias in 895 (827 years after the destruction of Jerusalem; comp. Jacob Saphir, "Eben Sappir," i. 14, ii. 186 et seq. ), and which contains two paragraphs of Masoretic passages united and ascribed to Aaron b. Moses b. Asher (§§ 3 and 70 in Baer and Strack's "Diḳduḳe ha-Te'amim," p. xvi.). Strack, Prolegomena Critica, p. 46.